THIS ARTICLE IS COPYRIGHTED FOR MUCUSLESS-DIET.COM ONLY. ALL RIGHTS RESERVED. THIS ARTICLE CONTAINS AFFILIATE LINKS FROM COMPANIES I HIGHLY RECOMMEND FOR MY CLIENTS. READ OUR FULL DISCLOSURE POLICY. When grains are broken down, fats, carbohydrates and proteins produce different acids in the body. Carbohydrates and fats produce lactic acid and acetic acid. Proteins produce phosphoric acid and sulphuric acid. Because these acids are hazardous to the body, they should be eliminated. Our body works in a highly sensitive range of acid/alkaline balance. Ideally, the blood pH must be a little alkaline at about 7.45. Once it changes by a very slight point, illnesses and even death may happen. Most of the food we consume such as meat, soda, alcohol and even grains, is highly acidic. This can be too much for the body to handle. blood pH since most grains are highly acidic. However, not all grains are the same. Some are actually mildly alkaline such as wild rice, amaranth, millet and quinoa. Why Not Use Wheat?Cultivated for high yields, wheat today contains high amounts of gluten, a health concern for many people. Higher levels of gliadin, a component of wheat, is another consequence of selective wheat breeding to increase mass production, which is a major factor to chronic inflammation. Let’s also include GMO wheat. Compared to ancient grains that haven’t been tampered or modified in any way, they are usually not refined and provides a load of health benefits. They also add a rich variety to your diet, in terms of texture, taste and nutrition. Further, wheat contains high levels of phytates or phytic acid – the storage form of phosphorus. All legumes, nuts and grains contain phytates, which make these foods hard to digest and may cause burping, gas, bloating and indigestion. Wheat grains have high phytic acid content, more than any other types of grain. Phytates is a potent acid. Once it exits the body, the phytates molecule bind to minerals, which are essential for the body. It steals calcium from the bones and iron from the blood’s heme. It can also affect zinc absorption. These are the reasons why phytic acid is considered an ‘antinutrient’. The acid-forming ability of wheat is augmented when ground to flour and baked using rising agents. The combination of fast-rising yeasts or baking powder puts the grain through a rapid ‘rushed’ process, preventing the grain from slowly, completely releasing its natural enzymes to develop a natural fermentation. Breads that are non-yeasted and baked using slow, deliberate rising have nearly 90 percent of phytates eliminated. This method comes in different terms – levain, desem or sourdough. However, if you use a grain that is naturally low in phytates, the bread will also be significantly low in all acids. The Mucusless Diet by Dr. Sebi isn’t your typical alkaline diet. This diet strives to maintain the right pH balance to prevent many different diseases and even help treat various chronic conditions. Not all types of flours are the same and acceptable on this diet. Some flours are acidic, others are neutral or alkaline. Hence, it is very important to choose the approved flours to achieve the right pH balance for your body. Spelt. This is one of the most popular non-wheat flours in the market. This ancient grain can be used in breads, pastas and in many wheat-free recipes. Spelt is a cereal grain from the wheat family, however, they are not the same with wheat. Though they look similar, spelt has a harder shell before it is milled. Spelt flour contains gluten, making it an easy substitute to regular wheat flour. Spelt is more nutritious than wheat. It contains more minerals such as zinc, iron, copper and manganese. Its high copper and iron content can significantly improve blood circulation, and even help produce red blood cells, hence consuming spelt can help prevent anemia. Spelt flour is also rich in thiamine, a B-vitamin known to strengthen the immune system and the body’s defence against infection. But the most important thing is that it has lower phytic acid content that wheat. Using spelt flour provides more flavor and nutritional benefits without dramatically compromising the taste and texture of your baked good. Buy my favorite spelt flour here. Teff. Native to Ethiopia, this tiny grain packs a nutritional punch to your diet. Aside from being gluten-free, teff is rich in protein, with a combination of eight essential amino acids necessary for growth and repair. One cup of cooked teff provides half-cup of calcium in spinach. It is also rich in manganese, copper, iron, thiamine and Vitamin C, which quite uncommon in grains. For diabetics, teff contains up to 40 percent resistant starches, with relatively low glycemic index. This can help diabetics take control of their blood sugar levels. Teff is commonly used to make Ethiopian injera (flatbread), however, it is found in many products such as cereals, pancakes, snack bars, pancakes and many others. Buy my favorite teff flour here. Amaranth. 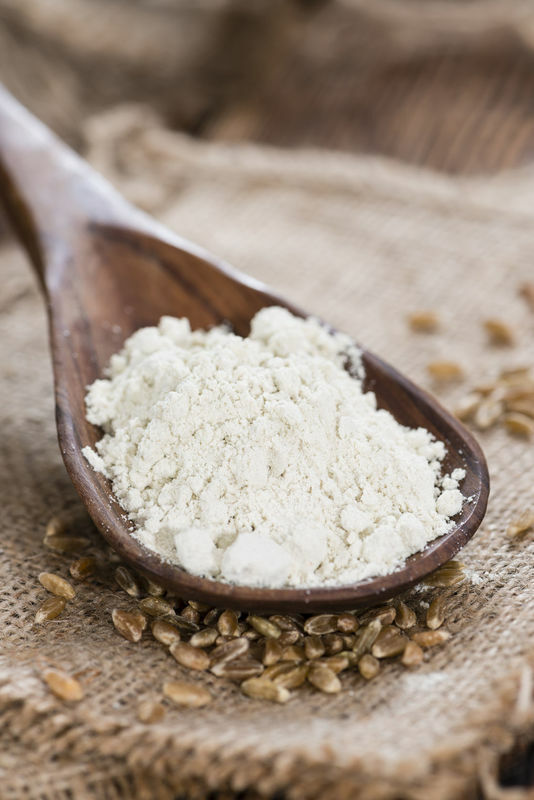 Regarded by the ancient Aztecs as a ‘super grain’, amaranth is considered an alkaline flour that is a rich source of iron, magnesium and fiber.Like Teff, one of the most important factor with Amaranth is that it is gluten-free. Amaranth flour is gaining popularity because of its remarkable nutritional profile. Compared to most vegetables, it contains higher levels of minerals such as calcium, iron and carotenoids. In addition, it is packed with high quality proteins at 16 grams per cup. Amaranth is a rich source of lysine, an essential amino acid, as well as primary protein globulins and albumins, which are more digestible and soluble. One major benefit of amaranth is how it counter inflammation. A study has been found that amaranth inhibited inflammation in mice and humans, suggesting that this healthy grain can be used as natural treatment for arthritis and other inflammatory conditions. Buy my favorite amaranth flour here. Kamut. The name KAMUT is a registered trademark for ancient Khorasan wheat to guarantee that it is 100 percent pure and organic, with no herbicides, pesticides or genetic alteration. Kamut, which is an ancient wheat eaten by Pharaohs, is emerging with a number of amazing positive study results that are totally different from the modern wheat. Compared to modern wheat, Kamut has been proven to have very low allergy and sensitivity profile, with powerful anti-inflammatory effects. A study comparing both modern wheat and KamutKhorasan wheat showed that that Kamut group had an average reduction of 7.8% on their LDL (bad cholesterol) and inflammation markers declined 23 to 36%. In addition, magnesium and potassium levels rose 2.3% and 4.6% respectively. On one hand, the modern wheat group had average of 2.8% drop in LDL, while magnesium and potassium slightly declined while inflammatory markers had mixed results with one dropping and another one increasing. These results showed the powerful effect of Kamut flour against cardiovascular disease and inflammation. Kamut flour has a highly diverse phenolic profile. Phenols are nutritional molecules that have strong antioxidant properties that can protect the body from numerous degenerative diseases. In addition, it contains significant level of carotenoids, another form of antioxidants, and are responsible for the rich golden hue of the flour. You can buy my favorite Kamut flour here. Rye. This cereal grain looks similar to wheat, yet is more slender and longer and differs in color from grayish green to yellowish brown. Rye is generally sold in its cracked or whole grain form, or as a flake or flour. Since it is hard to separate the bran and germ from the endosperm, the flour usually has a large amount of nutrients compared to refined wheat flour. Rye contains gluten, like barley and wheat. The protein is called secalins, a form of gluten. But unlike wheat flour, the type of gluten in rye is much less elastic and doesn’t trap much bubbles during the baking process, hence rye bread is much less airy. It also ferments faster as it holds more free sugar. Rye is one of the healthiest grains. Whole grain rye flour contains more dietary fiber than whole grain wheat flour. This increases the viscosity of the food mass, and therefore helps increase feeling of satiety and slows down digestive tract emptying. Again, due to the increased viscosity of food mass, digestion of starch is delayed. The low glycemic index of rye bread makes it a suitable food for those with Type 2 diabetes.